Home / Feature Slider / “Ghostbusters” thwarts naysayers in a ghoulishly fun and satisfying reboot. Poor ratings and trolling by sexist male filmgoers be damned, the Ghostbusters remake is the most fun I’ve had in a commercial blockbuster all year. It’s been more than 20 years since the original hit was released, and the reboot does not disappoint. Erin Gilbert (Kristen Wiig), a science professor at Columbia University, is horrified when she clicks on Amazon and sees a book she and her former bestie, Abby Yates (Melissa McCarthy), wrote in their heyday about ghosts and the paranormal. Erin is just about get tenure and the publication of the book is an embarrassment. In a huff, she goes to confront Abby, who’s now working in a forgotten community college basement trying to prove the existence of ghosts. While there, Erin lets slip someone contacted her about an apparition that’s apparently haunting an old house which forms part of a paranormal tour in New York. Erin finds herself taking Abby and the latter’s new partner, Jillian Holtzmann (Kate McKinnon), to the house, where the trio are astonished to see a real ghost. Erin is kicked out of Columbia when a video of the discovery goes viral on YouTube (no one believes it’s real, you see), and the three decide to strike out on their own. They find more ghosts in a subway tunnel, and also their fourth member: the sassy Patty Tolan (Leslie Jones), a subway information clerk. The name “Ghostbusters” is given to them by their secretary, the deliciously handsome and hilariously stupid, Keith (Chris Hemsworth). Together they have to figure out who is trying to break the barrier between the natural and supernatural worlds, before its ‘too late’. Ghostbusters is smart and hilarious without a preachy feminist plot and that’s what makes it so great. The main characters happen to be women. #MasculinitySoFragile needs to Get. Over. It. Director Paul Feigg, who did a stellar job with the action comedies, The Heat, and Spy (both of which feature Melissa McCarthy as a lead), presents a film with a witty script that takes the piss so well. Add a kickass ensemble cast with slick special effects and you have a winner. While McCarthy’s Abby is full of gags and Wigg’s super-serious Erin bring great deadpan humour, it’s Kate McKinnon and Leslie Jones who give standout performances. Both are Saturday Night Live regulars and bring wonderful comic timing with them. Jillian is the epitome of the eccentric, madcap scientist while Patty’s no-nonsense attitude often helps save the day. Much has been said about stereotyping Patty as a loud black woman, who’s also the only non-physicist in the group. In retrospect it would have been smarter to perhaps swap McCarthy (who could just as well have been a great subway clerk) with Jones. But Jones is so superb in her role and Patty’s remarkable knowledge of New York City’s history is critical to the Ghostbusters’ efficacy. She certainly does not come across as a token actor And Chris Hemsworth’s Keith, with his constant jovial misapprehensions, is the antithesis of his famous role as Thor. If there has ever been proof that filmgoers should NOT take recommendations from aggregate sites like IMDB and Rotten Tomatos, this movie might be it. 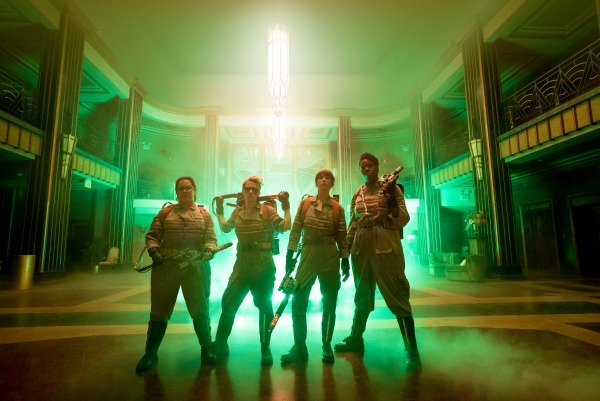 When it was announced that an all-female lead cast would headline the Ghostbusters remake there was a major backlash, mostly of course, from sexist assholes worried that it might somehow ruin the 1984 classic. The ratings on IMDB for the film were dismal at 4.1 out of 10. However, when divided into voting by males vs females, it became clear why: men on average voted 3.6 out of 10 and females 7.7. Critics though, even the men, for the most part have loved it (and by the way it is damn difficult to make a critic love anything too pop culture-y). Ghostbusters 2016 in no way detracts from the original films and should rather be viewed as standing on its own, taking in place in a parallel universe. It pays tribute to the 80s version with quirky and delightful cameos by the original cast (who surely wouldn’t have agreed to it if they thought the story was being butchered). Dan Akroyd makes a brief appearance as a cab driver; Billy Murray plays Martin Heiss, a paranormal debunker; Ernie Hudson is Patty’s hearse-owning uncle; Sigourney Weaver appears in the credits as Jillian’s mentor, Rebecca Gorin. This Ghostbusters is as delicious ghoulish fun as the first one, but so entirely different and creative that it doesn’t destroy the original. Feig proves that women are funny and that a female-fronted film can appeal to everyone. The film is everything a fan could want: from a revamped marshmallow man, as well as the original theme tune followed by a fantastic cover by Fall Out Boy and Missy Elliot . Haters, build a bridge and… (you know the rest). Previous: [LISTEN] Sam Cowen speaks about her book, “From Whiskey to Water”, a brutally honest memoir about addiction and redemption. Next: “Suicide Squad” fails to shine (and where is The Joker?!). “Boychoir” hits the high notes.